I created Noise Station in 2001 and designed it like a music programming system, something like the music equivalent of a word processor. Originally, notes were typed in, and the music calculated without live playback. As processing power increased, live playback become more viable. In 2001 my PC had a 133mhz CPU, and I knew that the full virtual studio system would need a 4-5Ghz CPU, 40 times more processing power than was available at the time! Noise Station is a virtual studio. You can use it to create instruments and complete music tracks with no extra hardware or software. Developed for Windows 98, the software has trouble working on operating systems after Windows XP. Noise Station generates sound using the concept of engines. An engine is a component that creates or modifies sound in some way. You might have a sine wave generator engine, or a low pass filter, or a panning engine. Engines can be applied per-instrument, per-track or per-song. Many of the parameters in the engines can be modulated, changed over time. Normal wav files are used as modulators, so the values can go up or down, following the cycle of the waveform selected. Many simple waveforms are supplied, sine waves etc. as well as fades. It's useful to view these modulators in a sample editor to see how they would change a parameter value over time. Songs are built from events, normally simply note events that trigger an instrument. Special events can be used however to change the song speed, or the volume of the current instrument, track or song. Notes are played on the PC keyboard and are programmed, not recorded in real time. When the song is complete, a high quality version can be calculated and rendered direct to hard disk. This allows even slow computers to produce very powerful audio effects. My first three albums, Synaesthesia, The Incredible Journey and the first version of The Spiral Staircase were created entirely using this software. 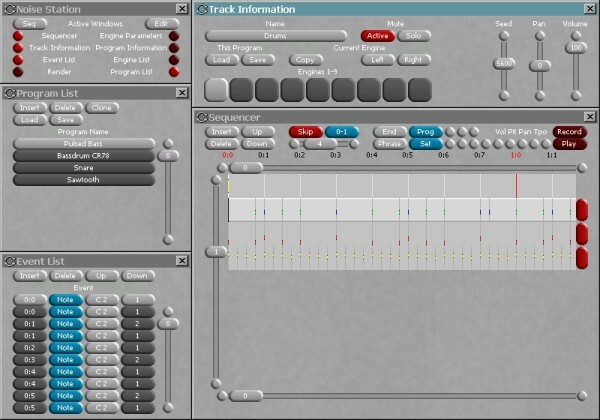 NoiseStation hasn't been updated in many years and may struggle to work correctly on modern computers, particularly the graphical interface. It is provided here as a free download in case you find it useful or interesting.